Turkey—and especially turkey skin and gravy—is high in fat, and even small amounts can trigger pancreatitis. Small turkey bones can also get lodged in your pet’s gastrointestinal system and cause blockages. If your stuffing contains raisins, onion, garlic, nutmeg, nuts, butter, or mushrooms, it’s a no-no for fido—and felines, too. Don’t leave wine glasses at snout or tail level. Alcohol can cause severe drops in body temperature, blood pressure and blood sugar. Overactive tails could also knock over glasses. You already know chocolate is dangerous for pets. But baking chocolate has even higher concentrations of caffeine and theobromine, the two substances in chocolate that are extremely toxic to dogs and cats. 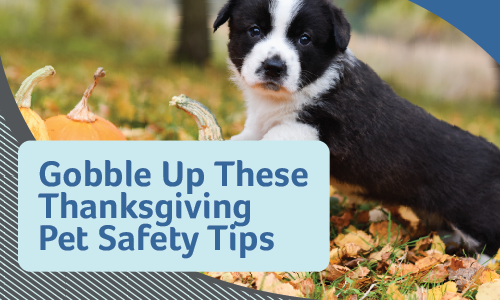 Show your pets you’re thankful for them by keeping them safe this Thanksgiving! If you have any questions about keeping your pet healthy and happy this holiday, give us a call at (630) 297-4709.